Following discussions with President Valdas Adamkus and Ambassador John Tefft on September 10, ABC president Nicholas Hollis visited Lithuania to explore the feasibility of establishing a counterpart agribusiness association in accordance with the U.S.-Lithuanian Working Group protocol of May 2000, signed by Alan Larson (Undersecretary of State for Economic, Business, and Agricultural Affairs) and Algirdas Rimkunas (Lithuanian Deputy Foreign Minister). 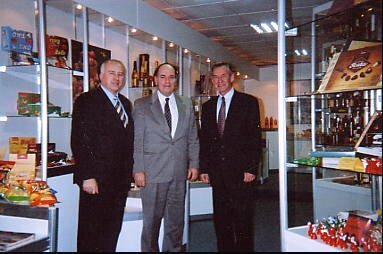 LITHUANIAN CORNUCOPIA -- Surrounded by world-renowned products from Lithuania’s bountiful agro-food system, ABC president Nicholas Hollis (center) is greeted by Minister of Agriculture, Jeronimas Kraujelis (right), and State Secretary Alfonsas Sigitas Tamosiunas (left) in the food exhibition hall of the Ministry in Vilnius. Lithuania is a small country with rich history and strong agricultural tradition. With its port of Klaipeda as a window on the Baltic, Lithuania is well-situated to participate in an expanding European Union and a resurgent Russian economy, as well as to strengthen its traditional Baltic/Hanseatic links. Since gaining its independence from the former USSR a decade ago, Lithuania’s economic revitalization has been progressing steadily. Across the many sub-sectors of the agricultural food system, however, progress has been inconsistent and spotty. During the Lithuania visit (October 14-November 7) initial meetings and presentations -- in key cities and countryside villages alike -- revealed enthusiastic support for the model counterpart agribusiness association. As a result, an ad hoc steering committee has formed, and participation in LT/ABC is growing (see attached enrollment form). The support list includes former ranking government officials, entrepreneurs, farmer groups, processors, ag input suppliers, academic/research institutions, pilot farms, and many others reflecting a broad cross-section of ag/food sectors and geographical locations. Discussions with Polish agricultural experts and PL/ABC leadership in Warsaw, Bydgoszcz, and Krakow (November 8-10) revealed considerable interest in working with ABC in the Lithuanian project. Entrepreneurs in both countries see benefits of expanding trade/investment links in the ag/food sector. Both countries suffer similar problems in their agricultural transitions and effort to join the EU. 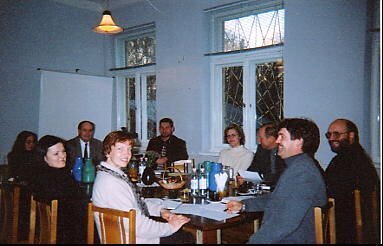 Visits to Lithuania’s Baltic neighbors, Latvia and Estonia, revealed similar interest (Note: AER participated in a conference on agricultural organization in Tartu (June 1991). COUNTRYSIDE MEETINGS -- coordinated by the Lithuanian Ministry of Agriculture with local agricultural leaders in villages and cities around the country enabled ABC to gather first-hand impressions of Lithuania’s agriculture and initiate exchanges which will be useful in developing an indigenous Lithuanian Agribusiness Association (LAA). The counterpart association project has received considerable support and favorable media attention. Once formed, it is anticipated the LAA will benefit with trade/investment information/contacts drawn from links with the network (including Polish Agribusiness Association) as well strengthened cross-sectoral dialogue within the country’s agro-food system. 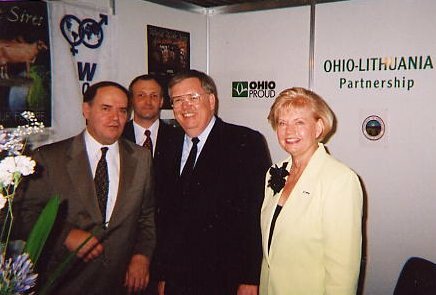 AGRO-BALT EXHIBITION -- ABC President, Nicholas Hollis (left), joins US Ambassador John Tefft at Ohio booth in Vilnius. Also pictured are Ingrid Bublys and Jonas Kutra. Hollis addressed the regional conference as part of the ongoing LT/ABC project at the invitation of Lithuania's Agriculture Minister J. Kraujelis (see publications).